Flying with Diabetes: Raising diabetes awareness. Now also available from Amazon as KINDLE EDITION. Flying With Diabetes (FWD) aims to inspire and advocate positive messages about living and flying with diabetes. We do this by carrying out exciting aviation speed records, and organizing FWD Days at aviation museums and airfields for children, adults and families, and local communities with diabetes. Our activities raise funds for the Juvenile Diabetes Research Foundation. 24-Hour World Record Smashed by Douglas and Thor! 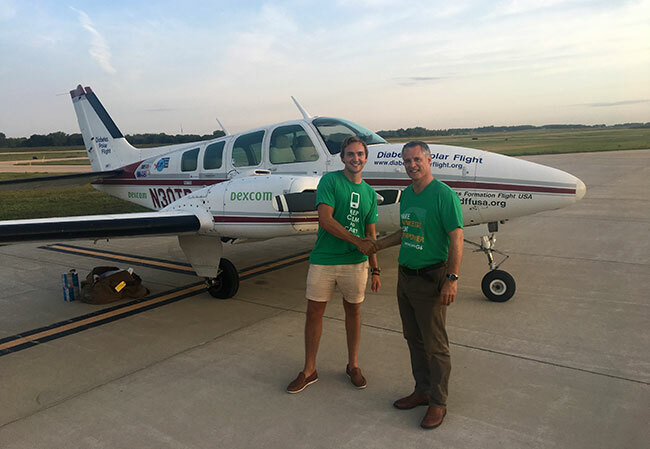 Douglas Cairns and Torborn Dahl (Thor), both pilots with type 1 diabetes, have smashed the existing world record to visit as many US states as possible in 24 hours, extending the number from 23 to 29 states. Douglas and Thor departed Sanford (Maine) at 0749 EDT on 27 July in the "Flying With Diabetes" twin-engine Beech Baron and zig-zagged their way down the US east coast as far as South Carolina, then westwards to Arkansas before heading north to Ohio and across Lake Michigan to finish at Albert Lea (Minnesota), just after 0600 CDT on 28 July. 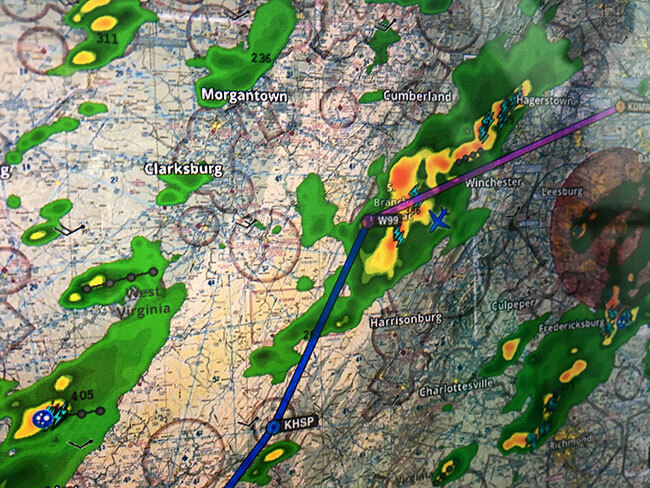 Storms over the mountains of the Virginias and South Carolina resulted in detours and threatened the landing at Grant County (West Virgina), and forced the pilots to expedite their departure from Pennridge Airport (Pennsylvania) as a storm moved in towards the airfield. This was followed by eight hours of night flying from Alabama to Iowa, with a full moon shining over the entire night-time route. Total airborne time was 15.6 hours, with the remaining time spent taxying and stepping out of the twin-engine aircraft at each airfield for photos. The pilots refuelled at three stops. Douglas and Thor, both grounded military pilots due to type 1 diabetes, believe that more countries need to update their regulations to allow pilots with insulin-treated diabetes to fly, which is why the 24 hour record flight was made. Dexcom, which produces continuous glucose monitors, is a sponsor of the journey. "We want to show everybody what can be done," Dahl said. "We hope the fact that we can accomplish this task - with diabetes being the least of our concerns - will light a spark and a hope with other people, as well as convincing regulatory units that it is time for a change." "Indeed, we want to show people what we can do when it comes to piloting with diabetes," Cairns said. "Diabetes need not limit the scope of peoples’ dreams and ambitions." Details and photos of the journey can be found on Facebook page "World Record Attempt: Most States in 24 Hours"
More photos can be accessed here from google drive. Another great flying day, setting a simultaneous speed record from London to Glasgow - subject to ratification by the Federation Aeronautique Internationale! We had originally planned a London-to-Bodo, Norway speed record, and meeting the local diabetes community at Sandefjord on the way. However weather conditions prevented this route, and instead we took advantage of a day’s clear weather on the 10th August to attempt a new world speed record in the UK, from London to Glasgow over 280 nautical miles to the north. 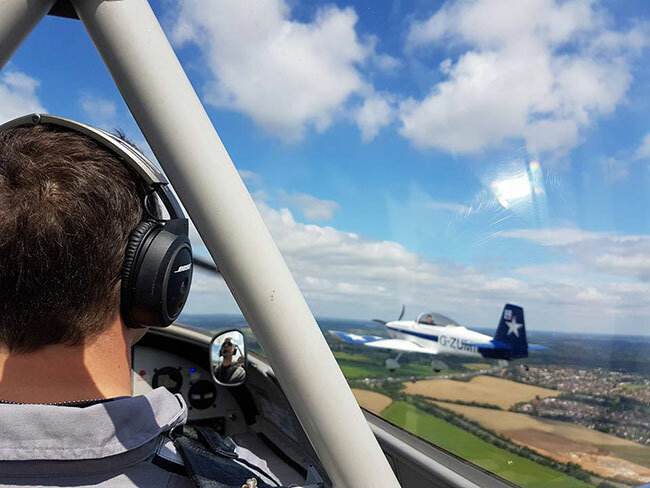 That morning Karl and Layla flew together in the Vans RV4 (G-RVNS) from Northampton to Denham, and shortly before midday, both Douglas, flying in the Vans RV8 (G-ZUMI), and Karl with Layla, flew in close formation to start the clock overhead Denham Airfield. 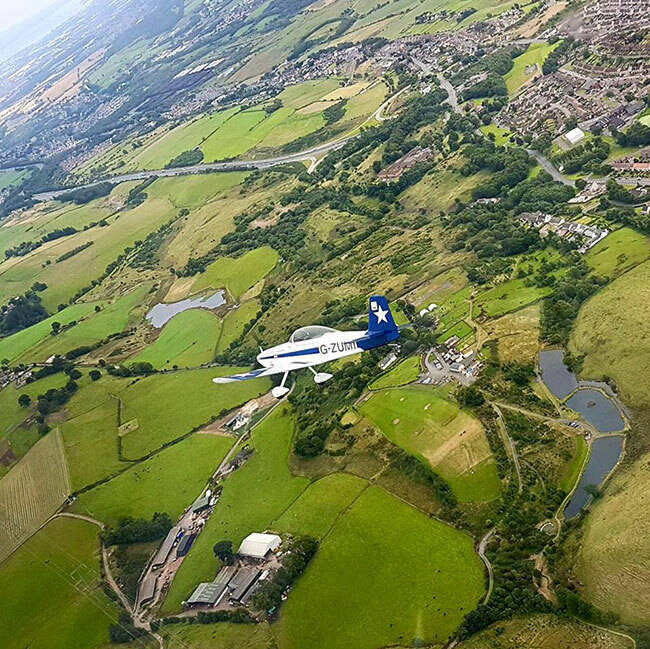 After a sunny start, 3,500-foot broken clouds prevailed for the majority of the route which passed by Derby and over the Pennine Mountains to the East of Manchester, then Penrith and Carlisle before reaching Cumbernauld Airport, close to Glasgow. As we flew over Scotland’s Southern Uplands where mountains reach over 2,000 feet, the cloud base lowered temporarily, but we squeezed through fine, quite close to an impressive set of wind turbines. After speaking with Glasgow Approach we flew overhead Cumbernauld in close formation to stop the clock. A very enjoyable flight over 2 hours and 4 minutes!! 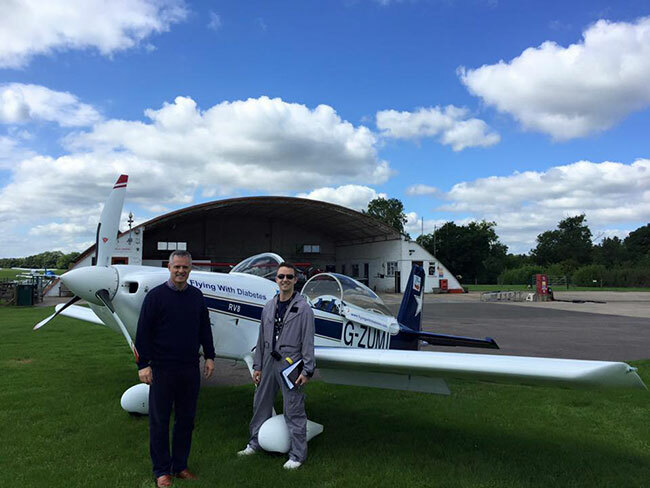 A huge thank you to Tim at Denham Airfield for clocking the start of the speed record, and Air Traffic Control at Cumbernauld for clocking the finish. The rest of the day’s flying heralded some truly memorable flying over the Scottish Highlands! We flew in loose formation by Loch Lomond and through Glencoe, one of Scotland’s most spectacular glens. 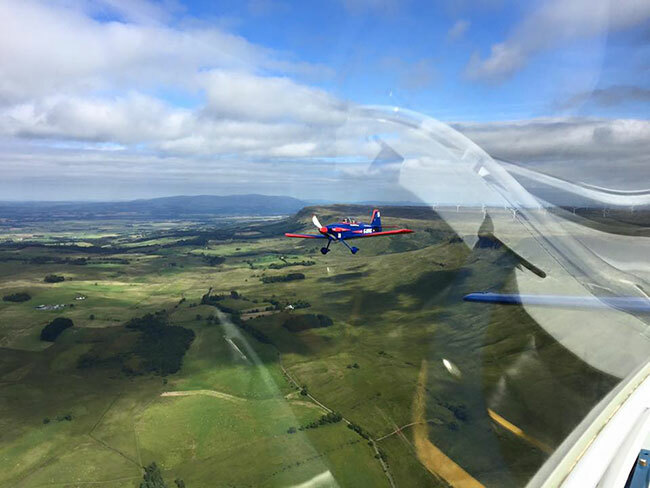 However, it was a bumpy ride through Glencoe, with a moderate westerly breeze tumbling off the mountain tops, and at one stage throwing the RV8’s maps and airport guide book around the cockpit, while both Karl and Layla were thrown around their cockpit with at least one head knocking the canopy! We beat a retreat across to the eastern side of the valley for calmer air, and once over Loch Linnhe the air was thankfully smooth once again. We flew south west from there and landed at Glen Forsa on the Isle of Mull which has a beautiful beachside grass runway with stunning views across the Sound of Mull to the Scottish mainland. 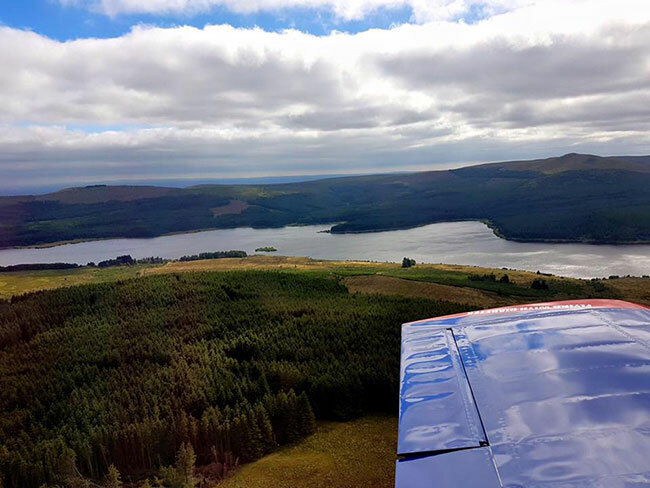 After a relaxing late lunch, we took off for Inverness, flying by Fort William, Ben Nevis and Speyside in the Grampian Highlands – stunningly beautiful scenery – before landing at Inverness with a sporting wind (thankfully) blowing directly down the runway. A truly great day’s flying! Plans are now afoot to fly the London to Norway speed record in late May/June 2018 – fingers crossed weather will "comply" next year.